As the Summer (for most of us) comes to a close and we seep in to Fall, we take a look back at the Mercedes Miami Swim Fashion Week back in July. 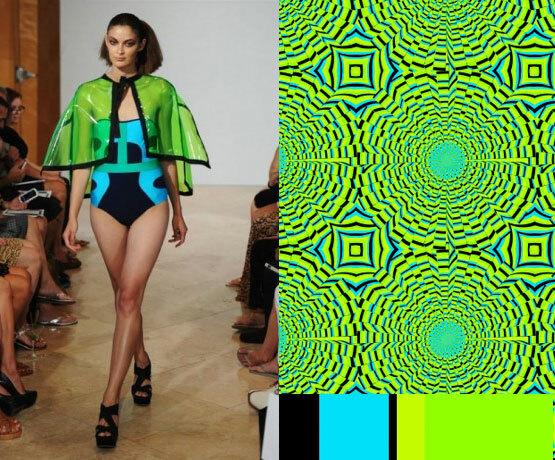 Noticeable neon Indian inspired Tribal Trends are seeping in to the 2012 RTW ("Ready To Wear") collections. Mara Hoffman collaged complex patterns and playful color combinations, using cooler hues like ostrich feather green and sky blue as a base to feature rays of fluorescent warmer oranges, yellows, and pinks. Showing a flair for Egyptian patterns and colors, Hoffman cites her husband Javier Piñón’s last collection O Babalon as an influence for her tribal trend. 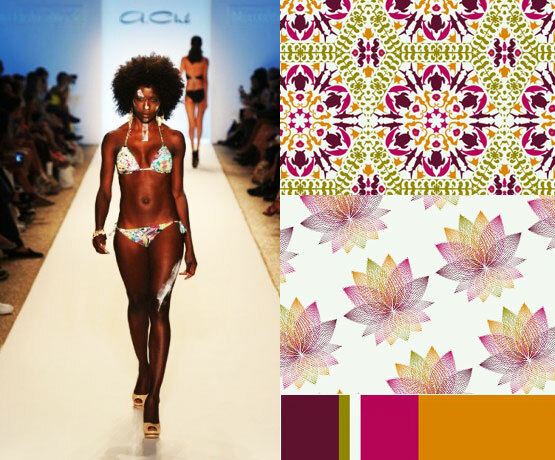 Dinelia Brazil and Luli Fama chanelled their respective Brazilian and Cuban heritages, using similar heavily saturated palettes to create a modern spin on tribal lineated patterns. Heavily saturated eye-popping brights are set to bleed into the next season, after being mastered this spring by fashion veterans from Haider Ackermann to Jill Sander, and Rachel Roy. Red Carter used blocks of electric blue, lime green and flaming coral to create strong futuristic swimwear bound to turn heads. On the other end of the color saturation spectrum, soft watercolors and bleeding patterns created a rainbow connection. Aqua Di Lara stayed true to its feminine style by evoking galaxy gazing, with midnight blues as a backdrop for whirls of soft pinks, mellow yellows and dewy greens. Softer pastel prints were also channeled by White Sands Australia in Australian bushland inspired colors of soft olive, sweet peach and pale wattle yellow. L*Space, Caffe Swimwear and A.Che also proved that pretty pops of posies on a light canvas are eternally classic. Regardless of your penchant for neon or pastels, next Summer is set to sizzle with these colorful new trends. www.pistolpr.comKate is a NY transplant from Sydney, Australia. Her stints styling for fashion magazines including Grazia and writing for fashion websites including Michi Girl have led to her being featured on style websites as a fashionista to watch. When she is not photographing backstage at NY Fashion Week or helping Australian fashion and accessories brands break into the US market, Kate is working her way through a hit list of new bars and restaurants in NY. That's odd, because I wouldn't describe any of those outfits or patterns as tribal. Cool, yes, but tribal? Yeah, I'm not so certain I really get the tribal part. :) I would have described them as: vintage, tie-dye, florals and futuristic! Kate know's her stuff, I'm not so much of the fashion runway scene guru! Also thanks for featuring this happy palette! great work!...and thanks for posting some of my templates, palettes and patterns. thanks for posting these too Molly! 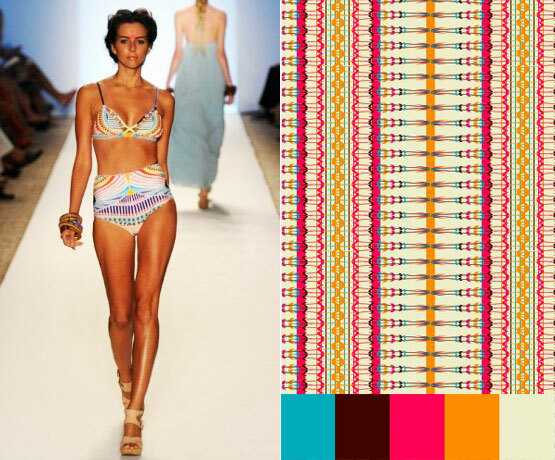 I love these palettes and patterns with bold summer colors, GREAT BLOG!! STUNNING BEACH COLORS!!! !....I would like a swim suit with these colors mix. You would both do well in the world of textile design! here in CL, I will send her this blog information, she will be so entusiastic to take a look at this great fashion blog.....i love your picks here...:)..great blog. This is wonderful ....and I would like to see more of these type participation /learning/educating the mind blogs. I would love to see a web design section where you can pool ideas either as a group or submit sites for down load and contests for that. To me the contests are never bout winning...it's about learning something through the eyes of another.. Maybe a trick, a better way, or an explanation to something that makes a clear difference. The poppin contest really helped me in value and weight and i have seen the likes on both patterns and palettes go up double. I have done a lot of research and development in color but it was geared more to kids and trauma (especially after 9 11) a fifth year education major with an extensive background in reading, writing and color therapy for kids....and mostly the research centered around children;s art and color choices to detect things he or she may be dealing with in their life that expression evades them ....but it never evades art and color. It's a teacher one valuale resource (if they would utilize it) to recognize a potential problem or emotional change. for example.... Before 9-11 i think every kid in the US drew the same family. The house, the fence, the stick mom and dad, the floating stick brother or sister, the stick dog and cat...and of course the sunshine with the smiley face, about 60 percent of the time a flag flying around the house. ... hills trees, and happy happy. On 9-11 our kids changed. We saw it across the board , from border to border. We followed these same kids for a while. But....during an art project school wide and for a fundraiser the kids were to draw what ever they wanted and then they could order shirts, key chains, cups, etc. with that design. Almost in totalitarian ...just right after the trade center thing....there were no families in the pictures, there was one structure, and the plane flying into it. There was no color every thing was gray to white to black. stick people in the picture did not have smiles...in fact they were hanging from the trade center with panic faces, falling from the WTC, and some on the ground. However, the one striking thing in every single drawing was....you guess it. The flag. 100 percent of all pics had that now...and the shocking truth to the mind of a child and just how amazing the little creatures really are. The flag... was in color. The only color in the pictures. We also found that the red white and blue were the first colors that were put into drawings before any other color. I guess it signified a peace, and calm. i said all this to say this....Color is more important than most people realize....and people find comfort in using colors and even expression by drawing or like here choosing a design and color it. There are a lot of people ...me included that will express or imply in drawings what we feel too vulnerable to talk about,, There will be a time in each of your life where you look at something and move on...but then you keep coming back to it and if I could leave one thing to any of you...pay attention to why. The detail ...the color....the depth of seriousness and or overly happy. It may be a message or a cry for help ... and honestly, people are not trained to recognize this....or Simply they just don't care...but, you might be the last hope for that person and just a single sentence or compliment or question to that person....might very well make a difference in how they come to terms.It could be a life you save. When you start to view it at a deeper level like that then your colors will take on a whole new association. Thank you for choosing this one I did for this blog. I am going to let 60we know because he actually designed it.. He should see it as well. I have come to love all of yall and appreciate everything each of you have brought to my table and life...it's not to be measured against one or the other....it's appreciating the difference in creative minds and learning a little or a lot while on this adventure. Amazing selection of colors, im really impressed , this patterns should be for real fabrics, i would certainly make a swimsuit with those.